"Powerful and important . . . an instant classic." In this groundbreaking work, sociologist James W. Loewen, author of the classic bestseller Lies My Teacher Told Me, brings to light decades of hidden racial exclusion in America. 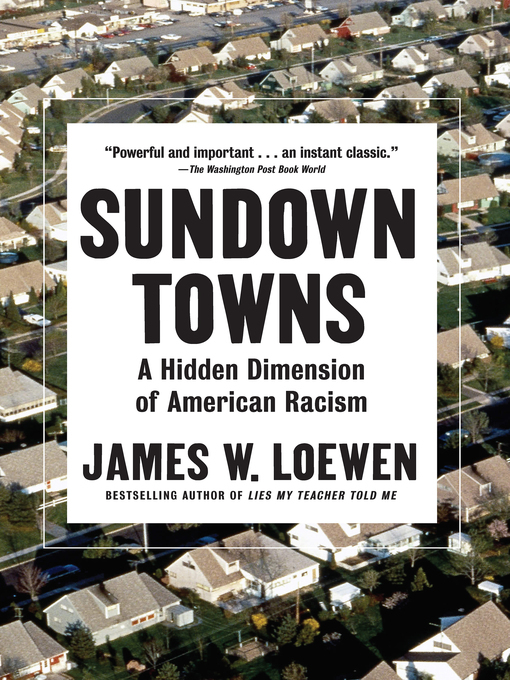 In a provocative, sweeping analysis of American residential patterns, Loewen uncovers the thousands of "sundown towns"—almost exclusively white towns where it was an unspoken rule that blacks weren't welcome—that cropped up throughout the twentieth century, most of them located outside of the South. Written with Loewen's trademark honesty and thoroughness, Sundown Towns won the Gustavus Myers Outstanding Book Award, received starred reviews in Publishers Weekly and Booklist, and launched a nationwide online effort to track down and catalog sundown towns across America. In a new preface, Loewen puts this history in the context of current controversies around white supremacy and the Black Lives Matter movement. He revisits sundown towns and finds the number way down, but with notable exceptions in exclusive all-white suburbs such as Kenilworth, Illinois, which as of 2010 had not a single black household. And, although many former sundown towns are now integrated, they often face "second-generation sundown town issues," such as in Ferguson, Missouri, a former sundown town that is now majority black, but with a majority-white police force.